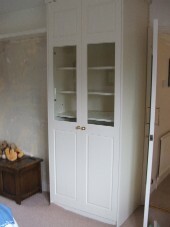 This painted white wardrobe system with glazed wood doors was made for a client in Westfield, East Sussex. It was made to replace an old wardrobe alongside a chimney breast. 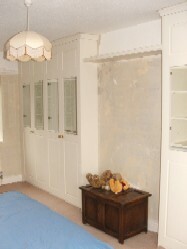 Two separate wardrobes sit either side of a chimney breast with a shelf to join them. If you like this this sort of wardrobe, get in touch and we can show you further shots of the inside as well as more custom made storage. Email 2nickholt@gmail.com.